Holy moly folks! Starbucks has an iced coffee (unsweetened) that you can buy in stores! I went to my local Safeway last night and found a carafe of coffee in with the milks and juices after hearing about it from a friend. It was much cheaper than buying it at the cafe (although you could probably make your own cold brew at home for cheaper – I will try that someday). I had also picked up some sugar free chai syrup from DaVinci this last week, so an idea was brewing (haha get it? BREWING! okay sorry…) to try to make one of my favorite pre-HMR beverages. A dirty chai is a chai latte with a shot of espresso. It is delicious and a total pick me up. But chai syrup and milk are both really high in calories, making this drink a TOTAL calorie bomb! Instead I made a super filling blended shake that was totally satisfying for only 170 calories! Blend everything but the ice first then add the ice and blend to desired consistency. SO GOOD! And when it gets colder I will be attempting a hot version that won’t have as much volume without the ice but should still be a fabulous morning treat! I am running now pretty consistently as I see half marathons approaching quickly on the calendar. Following my long runs I try to have some broth or something with sodium to replace lost salt from the run. However I am not usually really hungry. It means that some evenings I have a little extra food I need to consume to meet my minimum prescription! This week I will begin to transition to Healthy Solutions. I have been on the HMR Decision Free diet for nine long months and haven’t stepped outside of it. I am down 117 pounds at the nine month mark and will be starting the school year soon, thus it was in my best interest as I get closer to my goal but needed to also manage the stress of the new school year, that I transition now. So I was feeling a little bit of awesome on Sunday when I had two shakes left in my Decision Free prescription and wanted to make something special. This recipe isn’t really much of a new recipe at all. It uses other recipes to create a giant frosted cookie! I used my basic muffin recipe but used a vanilla bean syrup instead of the chai and rum syrups. I also only made one-third of the recipe (one oatmeal, one 70 shake, 1/4 cup syrup, 1/2 cup water, 1 tsp baking powder) and then I poured it out onto a silpat mat on a cookie sheet (parchment paper on a cookie sheet would also work). Then I baked it for about 15 minutes until it was browned slightly on top. I let the giant cookie cool before removing it from the cookie sheet. Meanwhile I made an HMR chocolate 70 into a pudding per packet description. 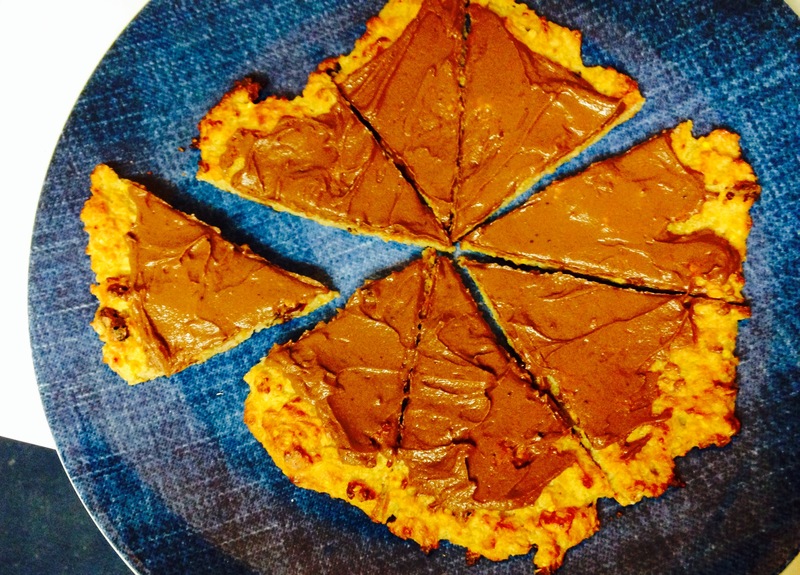 I spread it out on top of the giant cookie like frosting and used a pizza cutter to slice the dessert pizza. This is a very calorie dense dish for HMR – it’s about 430 calories! And depending on your prescription it may be more than 2 shakes (I know on my Healthy Solutions prescription is it four shakes!). So this is a rare special treat and I drank a lot of water with it. However it was super satisfying and a perfect way to top off an awesome day of running! I know it isn’t always a good idea to celebrate with food. I usually find other ways to celebrate accomplishments like getting a new nail polish or watching a trashy tv show I like. How do you celebrate without food? Every week in HMR class, we are given assignments. And I have wanted to write about this particular assignment for weeks but get anxious whenever I try to confront it. Today, coming from a class, I finally feel strong enough to share. Funny. My writing stopped again for 24 hours. See, the assignment that got my nerves in a bundle and me from writing? We had to log calories in addition to what MR we were eating. I became aware of what I was trying to forget. The first week on HMR, I kept calculating calories. But it was all in my head. Before the end of the week I had committed to memory how many calories each MR was. It took at least another week before I had stopped the mental calculations, to try to embrace the “more is better” and avoid depravation. So when this assignment was initially given, I was hesitant but committed to it as fully as all of my other class assignments. I refused to give anything less than 100% to my homework. However as the week went on, I began to notice how hungry I was. Instead of choosing a higher calorie entree, I would opt for a lower calorie one — even though I really wanted the original entree and it was only a fifty calorie difference. I was avoiding having the extra shake, because it was another 160 calories. The point of the assignment was to figure out water math. And to show us how a few extra MR in order to stay satisfied and “in the box” would not have an adverse impact on our weight-loss. However, even though I knew what the purpose was and I understood the positive elements of the assignment, I found myself restricting my caloric intake to my bare RX of meal replacements. I was starving and cranky and anxious. I am incredibly good at limiting calories. Initially. But upon reflection, the restricting always ended in a binge. A derailment. And then the end of that bout of dieting. My anxiety over numbers would end in my hands flailing and waving a white flag. I would give in… and then the numbers and the feelings of failure would haunt my dreams. Doing this assignment brought back the anxiety and the old behaviors, with one exception. Attending class that week and talking to others in my class and to the nurse and health educator… I realized that while I can’t handle the numbers now, I can handle the HMR diet. Because those 50 calories don’t matter in the long run if it keeps me from the 500 I would pick up at a drive-through. I don’t have to count calories any more. At least not for now. And that relieves a lot of my anxiety. 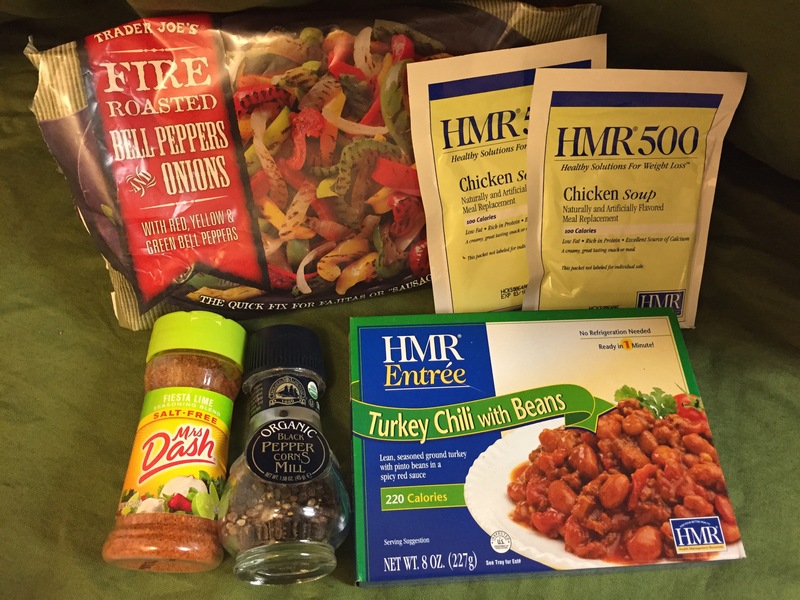 I know there will come a day I will have to live outside of the HMR meal replacement box but by then I will have the tools I need to do so confidently and will be able to face my fears and conquer my restrictive habits. I am working towards a balanced approach to health and I am proud of all that I am learning and doing in the process.